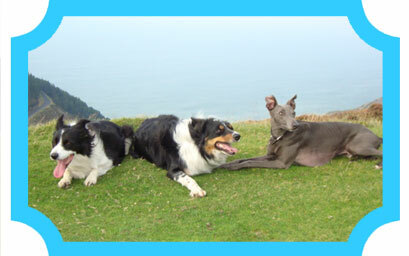 An Established Local, Independent Canine Business with many years experience in caring for dogs. After bringing home our third puppy to care for, whilst working part time & volunteering at the RSPCA, we decided in 2009 to introduce a service offering a flexible, friendly solution to juggling dog ownership along with people’s busy life commitments. Amarok is able to assist you in providing essential care for your dog(s) with our tailored services. We began by offering Dog Walking and Pet Sitting in Pontardawe, South Wales but have since found that there is a great demand throughout the Amman, Neath and Swansea Valley’s for a professional alternative to dog kennels. We have recently relocated to Ammanford (2016). Rather than send your dog to a kennel while you are on holiday – why not try our pet sitting service at your home or our luxury Dog Home Boarding package where your dog could be cared for in our friendly home environment. As well as your dog(s) we could also look after other family pet friends as part of an additional service. We aim to follow a routine that coincides with your family’s lifestyle. WHY COME REGISTER WITH THE AMAROK PACK? As well as welcoming your dog to our own home while you are away & providing an update service giving you peace of mind with information on how your dog is getting on (including images), we also realise, through experience and client demand, that there was a requirement to extend our services to include social etiquette for some clients dogs. We can accommodate for this with Amarok Pack Walks or Dog Day Care and other socialisation sessions with our very own pack & ‘honoury members’ . We have been complimented on the fact that our own Amarok pack have perhaps a unique ability to calmly assert and guide dogs with little experience in social circumstances – our own pack have had success to date – please see our reviews (obviously supervised by our ‘human carers’). Amarok likes to ensure that, prior to making bookings, we meet you & your pet either via an initial appointment at your home or a familiarisation session at ours for home boarding, so to avoid disappointment why not enquire into regisitering today! Whats in the name, Amarok? The name ‘Amarok’ has derived from the Inuit language meaning ‘Artic wolf’ and is considered by the Eskimo’s to be the king of the wild. ‘Amarok’ is also described in Inuit mythology as being a gigantic, lone hunting wolf. The modern day wolf is believed to be the ancestor of the domestic dog and is historically closely entwined with human culture. It is the unique relationship between dogs and humans that Amarok Canine embraces. Amarok Canine encompasses both an independent approach as well as developing the positive values that pack behaviour encourages. Our family run business endorses these principles. Supplying excellent tool for a stress free walk - putting you in control! Amarok Canine is proudly powered by WordPress and BuddyPress. Just another WordPress Theme developed by Themekraft.